Frisee salad with poached egg and duck liver at Mirepoix. Recently, my family and I visited Mirepoix in Windsor to celebrate my sister’s birthday. I was looking forward to trying it out, especially since I used to drive past the restaurant everyday when I worked in Sonoma County’s wine country. The interior is small, cozy and warm, evoking the French countryside feel that I imagine they’re going for. The food is rustic and very French in its generous use of butter on just about everything. 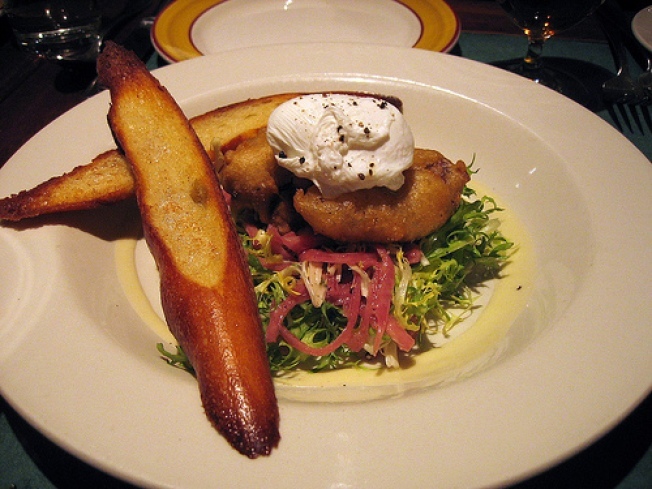 We started with the frisee salad with poached egg and duck liver, which was delicious. The pickled onions provided the perfect contrast to the fried and battered liver. We also shared a plate of the braised mussels in white wine and garlic broth. The mussels were tiny but the broth was comforting and full of flavor. This is where things started to go wrong. I must have had a Tony Bourdain moment or something, because the next thing I knew, I was ordering the braised sweetbreads with frites. I guess I thought that because I love offal in general, I’d love sweetbreads too. It turns out I’m incorrect. Maybe sweetbreads need to be prepared a certain way to be palatable, but you know something is wrong when the table next to you is whispering “she ordered the sweetbreads!” in horror. My sister was luckier. She took the safe route and ordered the tempura steak sandwich, which was rich and crispy. My dad ordered the hanger steak and my mom ordered the lamb. All of us had too-greasy frites doused in too much salt. In retrospect, I don’t know whether to blame my disappointment at Mirepoix on my own overly-adventurous entree choice or on the restaurant itself. The dishes seemed hit or miss, so I’m inclined to give it another try someday.